The new banquet trolley family from BLANCO fulfils the highest demands of design, functionality and ergonomics. It looks good in any setting with its timeless design and superior appearance. Thanks to their temperature adjustment down to the degree and excellent insulating properties, they provide the best possible food quality – even in case of longer waiting times. So that your guests rate refrigerated foods and desserts as "Excellent!" So that every warm dish remains appetising and fresh. 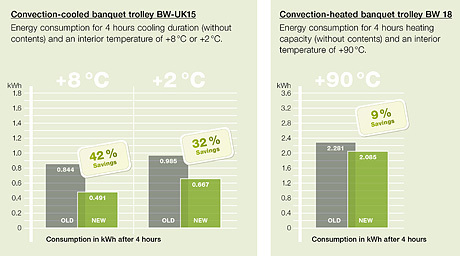 The new BLANCO banquet trolleys use up to 42% less electricity. An innovation from BLANCO: The half-height dividing wall for the simultaneous use of one-piece grates (1,084 x 650 mm) and GN containers or smaller GN grates. The user-friendly design of the digital regulator makes it simple to set and monitor the temperature. The widened impact bars on the short sides of the banquet trolley protect hands when rolling through doors and narrow corridors. The extended push handles provide ideal maneuverability for persons of all sizes. Their large-dimensioned handle diameters make them fit particularly well in the hand.